Micro Records Company has established clear defined steps and personnel duties to maximize accuracy and efficiency while scanning. Utilize our company pick up service; ship your documents directly to our headquarters; or bring your documents directly to us. No job is too small. One of our experienced solutions consultants will examine the scope of the project, taking into account the deadline requested and technical feasibility of the project. A project outline is completed noting the key scanning specifics, file format, and media for finished product. Documents are sent to a preparation station where specialists begin the task of assembling documents for the scanning process. The preparation specialist will remove staples and paper clips, remove and tape down loose papers, and repair any damaged documents. Operators scan the documents at the specified resolution and format determined in the project outline. 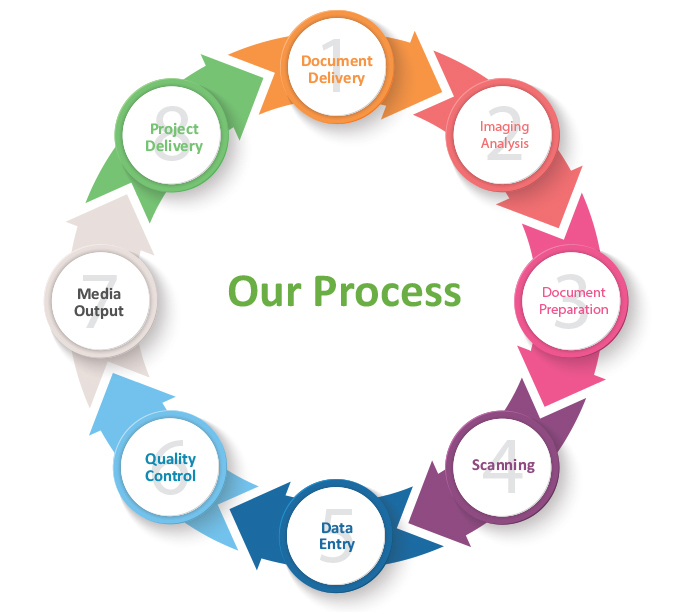 Our operators verify the quality of images and confirm that all documents are being captured while documents are scanned. Data entry specialist index documents according to specifications in project outline while also verifying the quality of the documents and noting any concerns in scanned images. After completion the data entry specialist gives any concerns to the quality assurance specialists for review. Our quality control associates review the scanned images to determine quality acceptability and verification of data entry. The electronic images are exported to the specified media, as noted in the project outline. All images are given a final verification to ensure complete quality assurance before delivery to customer. After the finished product is quality approved the work is delivered. Don’t worry that your files are ever out of reach. During the scanning process we also offer Scan-on-Demand services which allows you to have access to your files throughout the entire process. What are some of the advantages you gain by having your records scanned? Once files are scanned what type of format will the records be in? What will you do with our work once it has been scanned? How do we get our work to your facility? What can I do with work that has been microfilmed?